Discriminating artists and everyday clay users appreciate the ability to make an exact replica time after time. 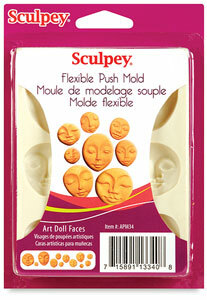 Simply mold, flex and release with these revolutionary clay molds. A unique flexible molding material means no messy release agents are needed. It works well with polymer clays, air dry and non-dry modeling clays. Flexible Push Molds are ideal for children, beginners, and first time Sculpey users. The resulting sculptures can also be used to decorate picture frames, scrapbooks, vessels, furniture, and more. Fairy Doll — The most difficult task in doll-making is creating the face, hands, and feet. This mold creates fine, crisp details — simply mold, flex, and release. The mold includes a head and face, two arms, two legs, ears, and a torso, all the features you need to create a beautiful fairy doll.